Back from our trip to NYC with my sister, we had a whole bunch of AVCHD material in MTS format that I just couldn’t get into iMovie. So the idea was to first convert them to QuickTime. Turns out there’s no shortage of “mts2mov” utilities out there but they’re all crapware. Horrible Windows-look-alike contraptions with ridiculous pricetags and big honking “try now for free”-signs… yuck. But then I turned to my old friend ffmpeg, downloaded, compiled and, as usual, had a fresh batch of QuickTime files ready for editing in no time at all. But this got me thinking - why not have a general-purpose ffmpeg wrapper for these kinds of occasions. At first I wrote a simple Cocoa app but then came up with a better idea - a collection of Automator actions. 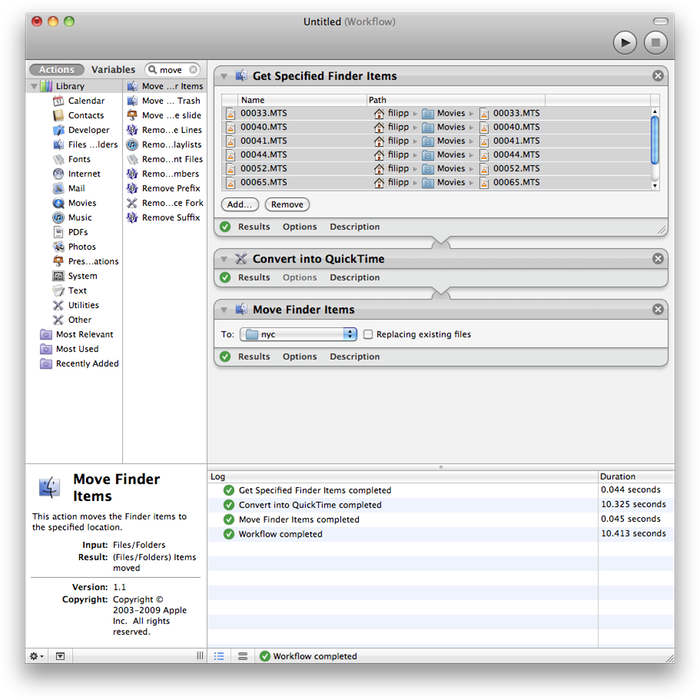 It goes by the name of Mediator and right now there’s only one action - “Convert into QuickTime” which simply uses ffmpeg (bundled into the action) to repackage an input file to MOV. The compiled ffmpeg is for x86_64 so it’ll only run on Core 2 Duo and beyond. Source and binary in Github.